Can SEO Scheduler Help You Get High Rankings? The Secret No SEO Company Wants You To Know: You can do your own SEO and get to the top of Google. If you’re like most people in the world, you don’t want to pay thousands of dollars to have your website “professionally” optimized. 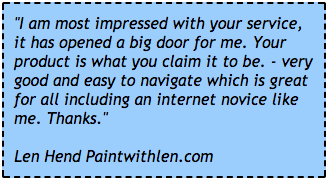 At least that is what many people told me when my SEO company was ranked #1 on Google and they wanted my help. My name is Adam White. I have been in the SEO industry optimizing websites professionally since 2003. I have worked for SEO firms, individual companies and have owned my own SEO company, which was ranked #1 on Google for the very competitive key phrase “seo services” until I sold the company in 2009. Can A Small Business Really Compete Online? One thing I found was that every business I would speak to was in a different situation and that the majority of the small businesses could not afford to have their website professionally optimized. I thought the search engines were supposed to give an equal playing field for all businesses regardless of size, but knowing how much I could get paid to optimize a website (I charged up to $20k a year for one site) it was clear that the people with the most money were still going to win out. I knew there needed to be an affordable small business SEO solution. That is when I came up with the idea for SEO Scheduler. I wanted to create a way for any small business owner to be able to achieve high rankings in the search engines without having to spend thousands of dollars a month to do it. So I sold my SEO business and took the exact same SEO process that I have used over the past 8 years, the same process that has helped hundreds of websites get to the top of Google for their most important keywords, and developed a system anyone can follow. The software is based on tasks, in other words different tasks for optimizing pages, content, link building etc are automatically created based around the key phrases you want to rank for. So the software will look at the key phrases you want to rank the most and give you more tasks for those phrases while also helping you target your other second tier key phrases. With an average of just 1 task per day you can have your website optimized in just a few minutes a day. There is no more wondering what else you can do to increase your rankings for a particular key phrase, SEO Scheduler automatically schedules out the tasks for you in a proven method that help you move up the rankings. SEO Scheduler tells you exactly what you need to do everyday to optimize your site and it also tells you exactly how to do it. There is no secret to SEO. 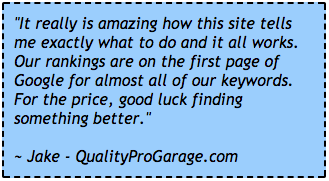 The big secret is that anyone can optimize their own website with a little guidance. Our instructions are so specific and so easy to follow you don’t need any SEO experience whatsoever to get your website ranking high in the search engines. It’s Not Just SEO Software, We Also Have SEO Tools! The SEO software I designed does give you step by step instructions on how to get to the top of the search engines for all of your key phrases, but I have also developed some awesome SEO Tools to help you along the way. 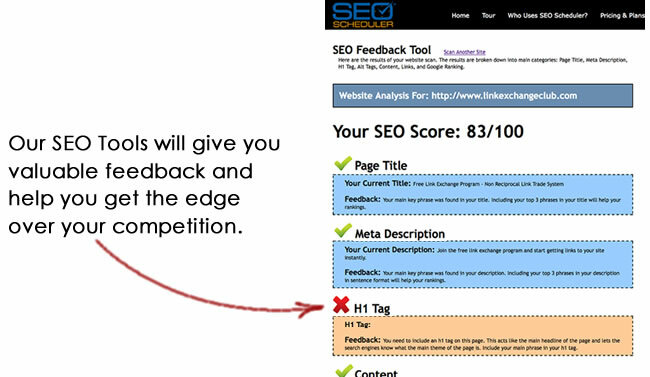 These tools will give you instant SEO feedback on any page of any website, help you find powerful link partners, help you analyze your competition and much more. My SEO software will tell you where your website ranks in Google, Yahoo and MSN for many of the key phrases you are targeting. 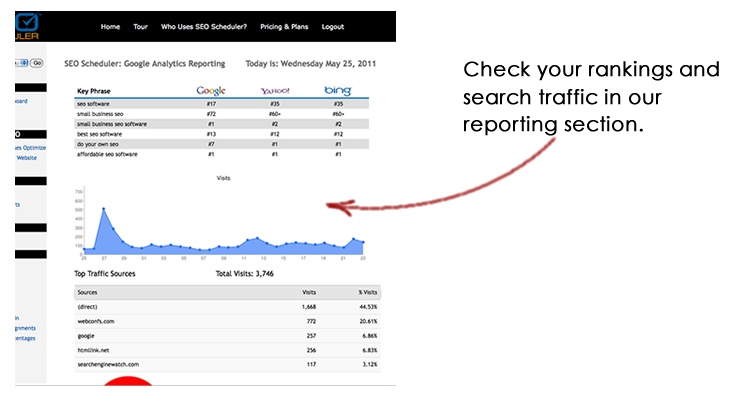 SEO Scheduler also integrates with Google Analytics to show you which key phrases are driving the most traffic to your site, which search engines are sending the most visitors and much more. There is no limit to how many key phrases you can put into SEO Scheduler to optimize for. The system is built to help you target as many key phrases as you want to. In fact the more you do the better off your SEO will be. I Help You Get Links To Your Website!! The hardest part of SEO is knowing how to get good links pointing to your website, and then knowing how to set those links up for maximum effect. When you join SEO Scheduler you will get access to all of the places I have used over the last 8 years to get links. Some of the links are FREE, others are highly discounted, and all are highly relevant to your site and will help build your rankings more quickly and for the long term. Take a look at some of our case studies here. You’re out of excuses. It’s time to start moving up to the top of Google, Bing and Yahoo for your most important key phrases. Knowing how much I used to charge for my SEO services people tell me I’m crazy for giving away my SEO process for such a low price. Take advantage of this great opportunity. Sign up today.